I have a confession to make: I’m in the midst of a weather identity crisis. I’m a girl who grew up with 4 distinct seasons, who craves that change every couple of months. Well, now I live in a land where if it’s not too hot to go outside, it’s too rainy to go outside; yeah, there are a few magical weeks in the “spring” and “fall” when the weather is fabulous and relatively mosquito-free. But there just aren’t those breathtaking weeks in the spring when all the trees are blooming. The colors don’t really change in the fall–it’s just like one day, all the leaves have fallen off the trees. It’s devastating. Throw in the bipolar weather and all is not well in my world! This is the middle of October and it is hot. So…I’ve started cranking my air conditioner waaaaaay down low. Like “That Snuggie is looking good!” low. Like “Is she going through premature menopause?” low. Like “Let’s call child services because this girl is putting her 2-year-old in footie pajamas when it’s 90 degrees outside” low. But I have needs! This is soup season and it has been WAY too long since I’ve had soups simmering in my kitchen. I honestly don’t care anymore if my utility bill is ridiculous. I’ll tell you what’s ridiculous: any temperature over 83 degrees in October. There. I said it. Soup’s on, baby. When I started my family/personal blog a few years ago, I occasionally posted my favorite recipes to share with my friends and family (yeah, look where that got me! 🙂 ). This was not only one of the first that I shared, but also one of my favorites. Ever. Of all-time. I got this recipe from my friend Jen and along with my friend Lisa’s breadsticks, it is pretty much the perfect meal. It’s my go-to meal to take to friends who are sick or sad. I make it for my family when we’re celebrating–I mean, really, there’s no bad time to make this soup and I’ve yet to find someone who doesn’t just about die with happiness when they eat it. 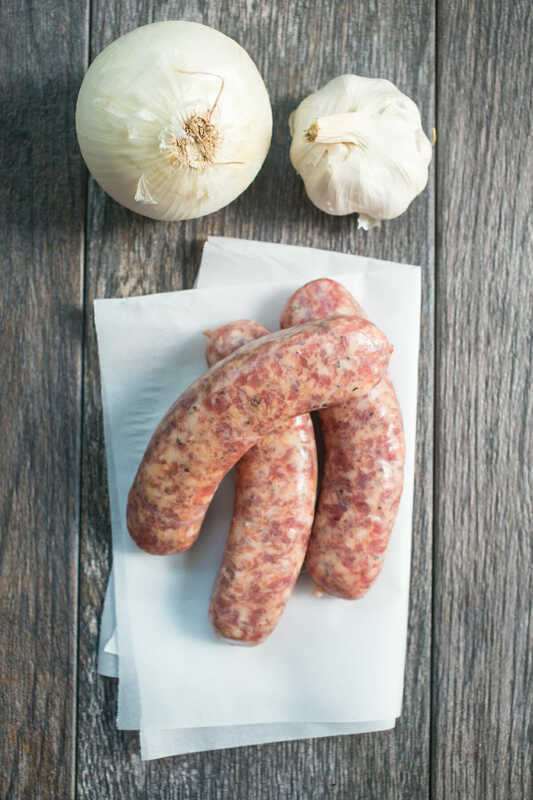 To get started, you’re going to need about 1/2 pound of sausage or 3 links of Italian sausage (I use mild/sweet, but if you like it spicy, go for the spicy sausage), an onion, and some garlic. Begin cooking sausage over medium heat, stirring frequently. If your sausage is pretty fatty, you’ll want to drain it when it’s about halfway cooked. Meanwhile, chop onions and garlic and add to the sausage. Continue cooking until onions are translucent and your sausage is cooked. Your house will smell heavenly. Add a can of diced tomatoes, a small can of tomato sauce, some apple juice (don’t forget this or leave it out because you think it’s weird–you’ll be sad if you do! ), water, and a quart of chicken broth. Also add in a cup of chopped carrots and a teaspoon each of oregano, and basil. Cover and simmer for 20 minutes. 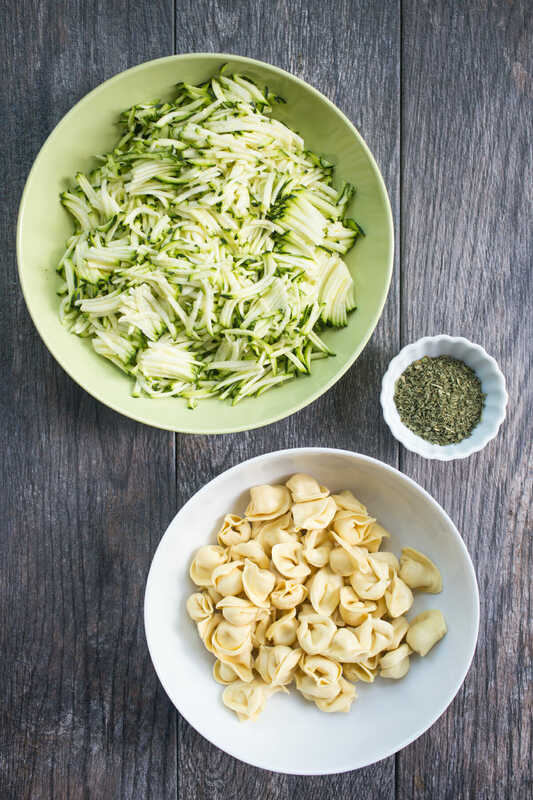 While that’s simmering, shred two medium zucchini, measure out two tablespoons of parsley, and round up 10 ounces of cheese tortellini. When the soup has simmered for 20 minutes, add the zucchini and parsley (NOT the tortellini). Simmer for 10 minutes, then add the tortellini and simmer for another 8-10 minutes or until the tortellini is tender. Serve with bread and freshly-grated Parmesan. Note: If you’re making these breadsticks, start the dough first, then prepare the first “phase” of the soup while the dough is rising. While the soup is simmering, twist the breadsticks, let them rise, and they’ll be done baking about the same time the soup is done. This sounds and looks wonderful. I live in SO. Ill. where we enjoy all four seasons- Autumn being my favorite. I think I would be depressed if I had to give it up. I forget that others don't enjoy the changing seasons- I just assume it's "Fall" everywhere. Your soup screams comfort though. It has to help! I tried this the other day & it was great!! I didn’t have any Zucchini so I substituted a little finely chopped celery. Very good – We thought it tasted a little like pizza, in soup form! I made it in the crockpot and simmered all day….I didn’t brown anything…maybe 6 to 7 hours total. I added carrots at last hour, and the shredded zucchini last 30 minutes….and tortellini last 15 mins…. Could you leave the sausage out to make it veg? This sounds so good! I have the same problem with 80's & 90's here in Arizona. I'm looking forward to making lots of soups and oatmeal when the weather cools off a bit more. I think you probably could, but you would need to add something like a mushroom/crushed fennel/red pepper flake combo to make up for the bulk and spiciness you would lose by leaving out the sausage. Trying this for sure, maybe tonight! We just pressed some apples and made apple cider at our cabin so this will be perfect! I might try this with italian turkey sausage. This looks so yummy. I am going to have to try it. I have 50 1 cup bags of grated zucchini I put in my freezer when my garden was plentiful so this is a great way to use some of that. Thank you for all your inspiration! Ohhhh…this looks good! It sounds like a wonderful tasting soup! For the basil, you specified that it's dried basil. You didn't specify for the oregano & parsely. Should they both be dried as well? Hey I'm famous 🙂 I always make mine with turkey sausage and I cube the zucchini–I like my soup chunky! Oooh, I make this one ALLL the time. And, people always ask me for the recipe and I gladly share it, then point them to your site. This really is a great go-to recipe. Yummy!! This soup looks great!! I totally know how you feel about the weather-seriously, i was laughing out loud when you were talking about kids in footie pjs and that whole paragraph. I live in Alabama (originaly from UT)….I know how you feel!!!!!!!! Thanks for sharing!! I love your blog!!!!!!!!!! Fabulous, Fabulous, Fabulous! My boys will LOVE this, thank you! Your blog not only gives me awesome recipes, it almost always makes me laugh. Thanks! The weather here (Houston) isn't cooperating either. The calendar says Fall, but the weather says SUMMER (high of 90 today). I'm pretending its fall too, with my pumpkin candles, fall decor, and lots of soups, chilis, and other comfort foods. Your soup looks yummy! stupid question, is Smoked sausage same as italian sausage (or at least a worthy substitute)? I only see 3 different sausage types at the store: spicy, smoked, and Polish but I get lost in the meat section. How many does this serve? I'm getting ready to make it tonight, but am not sure whether I need to double it or not. 2 adults and 5 little boys, but some with big appetites! momof2girls–You could definitely leave it out and have it be vegetarian, but I think you might lose some of the really great flavor. If you're into TVP, maybe you could season some TVP with Italian Sausage Seasoning (try http://www.penzeys.com to find it) and add that in? Gina–Try asking someone in the meat department to point out the Italian sausage :). It comes in casings and when you cut the casings open, it crumbles kind of like ground beef. Smoked and Polish sausage, on the other hand, are more "solid" inside. Julie–Hmmm…I think you should be okay without doubling it–I would say this recipe GENEROUSLY serves 8. We had some friends over who have 4 kids, so we had 4 adults and 6 kids, including a teenage boy and an almost-teenage boy. I doubled the recipes and we had tons and TONS of leftovers. haha Funny you posted this. I am making this tonight and taking it in to a family that just had a baby! I have an almost identical receipe for it. I have never done the apple cider though, might have to try it! Ooh… that soup sounds delicious! I will have to give it a try. Another great recipe! I have this same exact recipe! I always end up adding about 5 cups broth because it's just not "soupy" enough for me. I also use fresh parsley. We had this for dinner tonight so I had to laugh when I checked your blog and you posted it today. It's our favorite! Do you think you could substitute some other form of pasta that doesn't have cheese? My son has a milk allergy. We've managed to find a meat tortellini that doesn't have milk but I don't think that would work. Any suggestions? Great soup! I made it last night and got praised to the high heavens… it's around freezing up here to the north in Saskatchewan (Canada) so it really hit the spot. My only one little concern is about the ingredients list -the lack of consistent measures. Where I live soup stock comes in tetrapacks and not cans so I had to guess by adding and tasting how much to use. Please use good ol' cups and teaspoons (and so on) in the future as I love your recipes and hate guesswork!! The Mills- are you using the green "Print Friendly" icon on the bottom of the post? There's a button there to remove all images. Then you can hover over any text you want to delete as well. I just tried it and it worked fine for me. Are you still having problems? This soup looks delicious! As for the weather, you are not alone. I am reading all these great food blogs that are focused on Autumn food and I am still sweating and mowing my grass! Made the soup tonight and it was great! Thanks for the ideas. This soup was amazing! The smell in the house was unbelievable! Thanks for sharing this great recipe! Kate–your soup is divine! It reminds me of a tortellini soup they served in the Cougareat years ago (only theirs was watered down and without the sausage, which is a must-have ingredient). We had it with a roasted-garlic bread. Yum. That is one tasty looking soup! I really like the use of the zucchini in a soup like this. I am sick right now, so no energy to make this…but the weather would be perfect to make this! thanks for posting and I love your photography! I'm having trouble printing the recipe yes I removed the images bu the text does not print???? Awesome recipe! I made it tonight and it was sooo delicious. Great flavor and it was a very easy recipe to follow. I also made the breadsticks that you recommended to go with it and they were delish. A little more work but definitely worth it and it makes a ton. Next time I'll probably half it. But thanks for sharing these great recipes. Your website is my favorite! Sara, I was using that, and still couldn't get it, let me try it again. Thanks so much! Hi, I noticed you have lots of questions but nothing about apple cider. What is that? Is it just in the drink aisle? I have apple cider vinegar but i'm guessing that's not what you mean. Apple cider vinegar does not work. I just wasn’t paying attention when I made it this time (and probably the last time). Apple cider would be yummy!! thanks for the clarification on the apple cider! I made this today. I didn't have any tortellini, but I used some cheese ravioli. It worked great!! My husband ate tons, and I've got some left over for lunch. Also, I don't like zucchini so I took that out and added celery. This is wonderful!! I love soups, but it is hard to find many that the whole family likes that isn't loaded with yummy butter and cream. 🙂 I used cheese ravioli because I happened to have some in the freezer and it worked very well. I do think I will double it next time because I love love love soup leftovers! Love your blog! I made this soup this week and it was fantastic. Looking forward to trying more of your recipes! I made this tonight using cajun sausage (it was all I could find) and it was oh so tasty! Definitely liked the extra kick. Made your apple dumplings for dessert and oh my gosh were they AMAZING! Thanks for all of the terrific recipes! Can this soup be frozen?? I'm going to be having a baby in a couple of weeks and am stocking up on freezer meals 🙂 Thanks! If you use dry tortellini do you have to cook it separately first? Andrea and Terrance–Nope, just toss it in! 🙂 If it gets a little thick, just add a little more water, chicken broth, or juice. I made this for our anniversary the other night and it was so completely yummy. My husband, (captain picky-pants);) now has a new favorite soup. Needless to say I am sure it will grace our menu often. Thanks ladies! Thanks so much for the clarification on apple cider. In my part of the world, apple cider is clear, bubbly and alcoholic. Didn't think that's what you meant… I'm looking forward to trying this recipe out. In most of North America, the alcoholic version is called ‘hard cider’ and it’s the fermented ‘next step’ from the fresh cider used in this recipe. my husband and in laws loved it too! This is going to definitely be one of my go to recipes now – IT'S SO EASY! Thanks for this one. I just added this site to my food blog and my facebook page. Looking forward to trying out more of your recipes! This is the best soup I have ever tasted! THANK YOU for posting this recipe! Then again, every single one of your recipies are out of this world! Wasn't quite sure what I was looking for when I went to buy the sausage. So I just bought some spicy ground sausage (1lb). How much should I use? I guess my question is, how much is the equivalent of 3 links of sausage? Give Johnsonville Italian sausage a try. They are by the Bratwurst in the fresh meat section. Should come in a similar package to Bratwurst as well. Jenissa- 3 links would be 12 oz, or 3/4 lb. I made this soup the other night to a family full of skeptics. As soon as the soup was underway and the aromas were drifting through the house, I was hearing -"When will it be ready?". Needless to say this soup was a HUGE hit with my family and I look forward to making it again. I also made it with the garlic twists – AWESOME. Thanks so much! Dinner was great tonight! Hubby sat down, took a bite of soup, a bite of the breadsticks and said, "You got this off the blog huh? It's way good." I made this last night and it was SO good! I loved everything about it! You girls are awesome! I made this tonight for dinner, and it felt like the perfect fall meal! I didn't have any zucchini, so I used a yellow squash that I had on hand; it made it even more season-appropriate! Thanks! Just wondering if you've ever frozen this soup for a future meal? I'm wondering how it would do frozen. I think it'd be okay but what do you think? By the way, it's one of my favorite soup recipes! I seriously need to try more stuff on your blog, the recipes I do try are so good that I keep just making the few I've tried. Eve–It freezes okay; the concern is the tortellini. If you're making it with the PLAN to freeze it, you might want to consider leaving out the tortellini and then when you reheat it, add them in the last few minutes. I made this soup for my Halloween party a couple of weeks ago and meant to tell you how delicious it was. I served it without trying it first and finally sat down with everyone a little late. I started eating it and proclaimed, "This is delicous!" Everyone agreed and asked who made it. Proudly, I announced it was me! Of course, I gave all the credit to you all. Thanks for yet another delicious recipe! You gals rock my world! 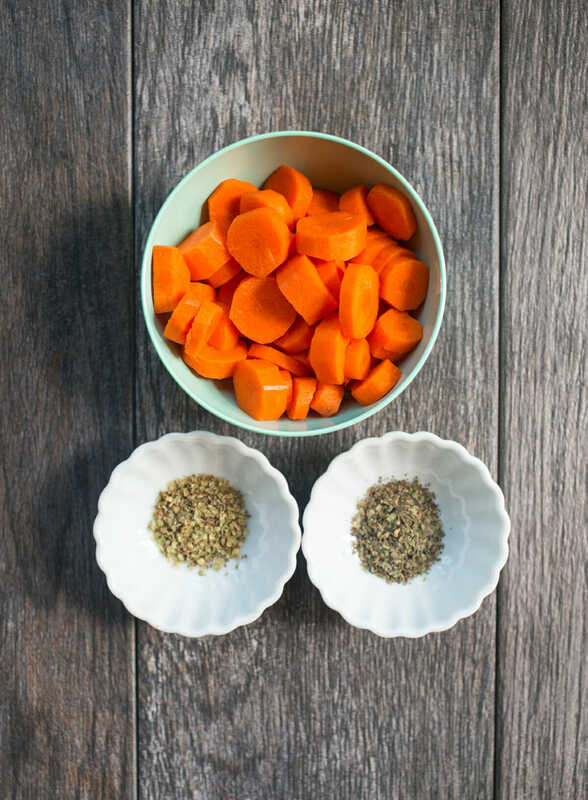 I loved the recipe, aside from as "herb -ie" as it was….it was a little strong for me…..I might have substituted the sausage for ground sirloin and not used as much herbs. Good recipe though. Thanks for sharing! Made this for dinner tonight and we really liked it. My nephew had 3 bowls of it. Thanks for the great recipe! Um this was amazing!! 🙂 my husband loves it and could not even tell there was zucchini (hes a zucchini hater!). My 3 year old was in heaven and kept telling me how amazing the dinner was! WILL MAKE AGAIN AND AGAIN! 🙂 we also made the bread sticks with it and they were SO good with it! could i do this in a crockpot? if so, what is the best way? soccer mom–You could cook most of the soup on low all day and then add the zucchini in the last two hours (on high). Cook the tortellini separately and then add it right before serving. I love this. My kids ate it. My husband ate it. And I loved that I didn't feel like I was in a dirty kitchen with dishes from yesterday and today…I had already been transported off to Italy to eat this delectable soup! Will have again. And again. And already thinking about taking it to the school party next year when we have a soup contest! Oh…and I didn't have apple cider so I used apple juice with a little bit of cinnamon and a little nutmeg and it seemed to be fine! 🙂 Thanks Kate! Made this tonight and it was amazing! I am the only one in the house that likes zucchini and everyone LOVED it!! Thanks for another great recipe! Made this for dinner tonight and it was a hit with my husband … and my 3 1/2 year old picky son! I made the breadsticks as well … yum! This will definitely make it into our regular rotation! I made this last night and it was a hit at our house too! One of my daughters is a vegetarian, so I followed the recipe w/o adding the sausage & subbing veggie stock until it was time to add the tortellini. Before adding the sausage to the big dish, I dished out a serving or 2 of soup, put it in a small saucepan and then added the tortellini to both pans. My vegetarian thought it was delicious too. Thanks! I like to serve it with garlic bread – horizontally slice a bagette, top with roasted garlic butter (roast one head of garlic and add to 1 cube of softened butter and a couple tablespoons of raw garlic) top with a sprinkle of paprika, a teeny tiny bit of garlic salt. Bake in the oven for about 20 min.. This is a keeper! I made it tonight, and even my 17 yr old son, who claims he hates soup because it doesn't fill him up, went back for thirds, and then just couldn't eat any more. It was loved by the whole family. This soup has fast become a go to meal in the snowy mid-west…thank you! Yum- looks so good. would beef broth work the same as a substitute for the chicken broth? I forgot to pick that up at the store… oops. Jacy–Beef broth definitely has a stronger flavor. I’m sure it would still taste good, but it would be a very different flavor. Do you have any chicken base or chicken bouillon cubes? I am so excited to try this! I’m going to make it for my small group Wednesday night with breadsticks, as you suggested. I have a question…I am making this for 6 adults. Should I double? 3 men, 3 women, one being pregnant. If we have leftovers, does it freeze well? Staci- you DO have to make this, it’s fantastic! lol. Yes, you can definitely use fresh herbs. Just remember the ratio is 3 to 1, so you’ll want to triple the amount for fresh. Also, I’d probably wait until the last 15 minutes to add them in. And the San Marzanos would be just fine too! I popped in a parmesan rind while the soup was simmering and it gave it a really nice depth. Thanks for a great recipe! Just a note – my husband and I are vegetarians, so I switch the chicken broth out for vegetable broth and it still tastes amazing. 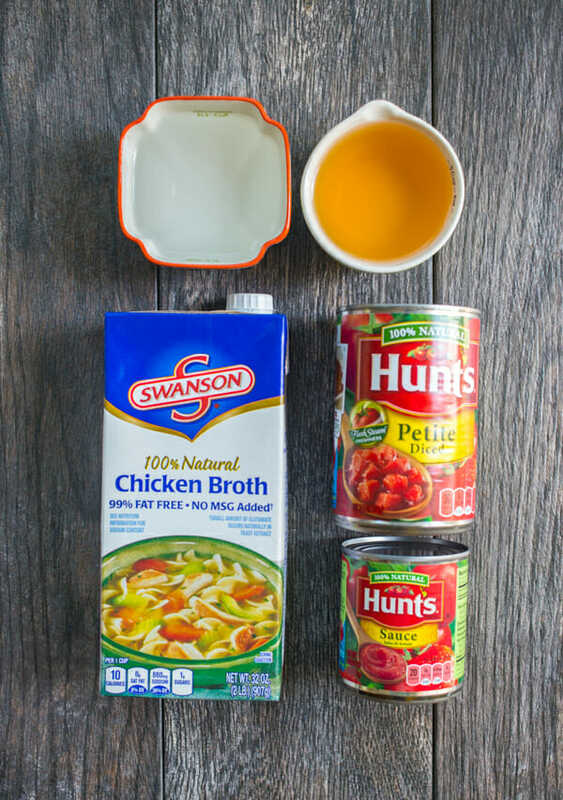 Sometimes you can find a faux chicken broth that’s called “No-Chicken Broth” by Imagine Foods. The Italian sausage isn’t a problem, either, because Morningstar Farms makes a great faux version that I use. Love, love, love this soup! Thanks, Kate! WOW thanks for sharing WE love soups!!!!!!! Hey Kate, I live in Mississippi. I feel your pain about the season’s thing. I have had to live without them my whole life. I get the occasional glimpse of season’s changing whenever I travel during the fall/winter or spring. I would LOVE to make this recipe but my husband can’t eat cheese. Any suggestions on how I can modify this recipe? Thanks!!! My hubby doesn’t like tomatoes – could I leave out the diced tomatoes and add extra tomato sauce? Ummm….. SO GOOD! I so made this for dinner even though it was over 90 degrees today, and topped it off with an apple cider floats which I am eating as I type! SOOO GOOD! THANKS GIRLS! When you say “2 cans of chicken broth”, how many oz is that? I have multiple sizes of chicken broth at the stores. I’m afraid to get to much or not enough. 2 15-oz. cans of chicken broth. I just sent this recipe to a friend and realized that in the “PRINT THIS” section the 2 TBS of dried parsley is missing from the list of ingredients. I see Itialin sausage in links like bratwurst. Is that what you mean by links? Otherwise I think of breakfast size links and that wouldn’t be much sausage! Yep, you want the stuff that comes in the links (although sometimes you can find it packaged like hamburger). Just be sure to slice open the casing and remove the sausage because it’s not solid like bratwurst or kielbasa. Just crumble it up and brown it with the onions and garlic. I made this soup. My family loved it. Will make it again & again. This is the best soup! My husband loved it and it was so easy! I will be making this several times this winter. Just made this wonderful soup! I used hot Italian sausage and added 1/2 jalepeno leaving in the seeds as we prefer a bit more spice/heat. It was still tasty and not too spicy. My husband is not crazy about pasta So thinking of using potatoes versus pasta next time. Definitely a keeper! I tried this tonight with my family of 5 (7 yr old, 5 yr old, 18 mth old and hubby). It was sooo delicious. Quite possibly the most flavorful soup I’ve ever made and packed with veggies too. My kids agreed you can’t really taste the onion and zucchini. It was so good. Thanks! THANK YOU!!! my extremely picky eaters just downed 2 bowls a piece, in about 15 minutes flat. I’m one happy mama! This soup ROCKS! I made it for a family get together and it was by far the most popular soup available. I didn’t even get to have left overs it was so popular. Thanks, it’s my new favorite soup! I made this soup (along with your baked potato soup) for a family lunch after we blessed our baby this past Sunday and it was the first one GONE!! So, so, SO yummy!!! The recipe got a lot of compliments. 🙂 I can’t wait to make it again! made this today along with some homemade breadsticks and it’s DELICIOUS. It’s going to be menu staple from here on out. Thanks! This is definitely now my favorite soup recipe! Thank you, thank you, thank you for all of your recipes. Now my family gets a new recipe (or more!) every month and we are loving the new variety on our menu! I have made this several times and love it. I use grated zucchini and chunks of zucchini also! It fills your mouth with flavors and textures. . .yummy! Made it and it is delicious! Lots of flavor, easy to prep and just about an hour to make. Did not have apple cider and substituted with apple juice, will try it with cider next time I make it. I made this tonight for the second time. I used bow tie pasta instead of tortellini because the hubby doesn’t like tortellini. I added 1/2 cup of quinoa and 1 cup of water. Then cooked everything in my electric pressure cooker. Turned out amazing that way. Cooked really fast (9 minutes) and the pressure cooker forces all the flavors together. Although it came out more like a pasta/casserole type dish heather than a soup. Still delish. So I have to say this is one of my all time favorite recipes that is on your site, although I really do have MANY favorites! Ive made it at least 20 times over the course of this last year, when I fist stumbled upon your blog. I always wondered what the deal was with the apple cider, but like a good recipe follower I never omitted it (mostly because Kate was admit not to:) I have always bought apple cider in the plastic bottle, the one that sits next the the apple juice and tastes just like apple juice. I have also used just regular apple juice in a pinch and even went as far as to use the packet spiced apple cider mix. My point here is it always turns out great and my family devourers it. Although this last time I made it I used the REAL stuff, the jug you get from your farmers market after going to the pumpkin patch (well that my story at least:), and HOLY SMOKES what a difference!! It seriously made all the flavor of the spices just POP! It was more amazing that what it normally is (and I really didn’t think that was possible) SO now I know what ‘the deal’ is with the apple cider, it’s the secret ingredient! 🙂 Now Im off to go freeze a bunch 1/2c portion of the ‘real stuff’ so I always have it on hand. Thank you both for this fantastic recipe!!! Great idea about freezing the apple cider…I’ll have to remember that this fall! Do you use hot or sweet Italian sausage? Thank you so much! I can’t wait to try this! I made this last night for dinner, and my whole family of picky eaters loved it! It was delicious! I’m so excited to make it again. Thank you for this recipe! I made this sausage soup last night and it was delicious! I did just cut up the zucchini instead of grateing it . It was VERY COLD here and this hit the spot with hot bread from the oven! YUMMY! I just finished making this soup and loved it! I used the Jimmy Dean Turkey Sausage Crumbles to lighten it up even more. I just want to say thank you for this amazing recipe! I’ve made it numerous times for numerous people (especially great to give to someone who just had a baby) and EVERYONE loves it! Even my super picky 4 year old actually eats this! Thank you! Thank you for the awesome recipe. I just reposted it making it 100% shelf stable. You guys are such an inspiration! Recipe calls for apple cider, but the instructions don’t mention it! When does it go in??? Thanks! It just goes in with all the other liquids. The instructions called it “juice” so maybe that’s why you missed it. I changed it to say “cider” so hopefully that’s more clear. Enjoy the soup! Can you use apple juice instead of cider? Or can you buy apple cider in smaller than a gallon jug? I am not a fan of drinking it and don’t want to have to buy a ton of it. Mmmmm this sounds really yummy. For those that have made it does have to be the tortellini? Can I use just bowtie or shell pasta and still have it be really good. Asking since I have to make everything dairy free (and there is not a single Tortellini option at our grocery store that doesn’t include cheese). 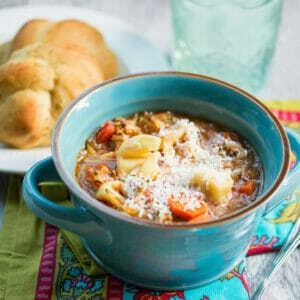 I make a similar soup with tortellini and I think it would be just as good with another pasta without cheese. I would use bow-tie. MMMM, thanks for inspiring me every day to cook for my family. Love the ideas! I make a soup similar to this and put red bell peppers in it as well. It gives it an extra kick but not too much spice. I like that this one calls for zucchini and I think I’ll mesh the two. YUM! Can you substitute the sausage with any other kind of meat? We are not pork eaters, but this sounds really good! Suggestions? My family and I have been making this soup for a couple of years now. It has become our “go to” soup for get togethers, when we are sick, when we need to feel “healthy” again, and any other reason. We all always add a couple of handfuls of chopped spinach at the end to give it more veggies too. This makes enough to eat on for several meals and is healthy as well! Thanks for giving all of us a tradition that we will hopefully pass on to our children! This soup was amazing! My kids loved it too and didn’t even complain about the vegetables. Of course, it was late and they were starving so that might have helped but once they tried it they were hooked! The breadsticks were late as I need help with time management but tried them the next day with the leftovers and they were fantastic also! Thanks very much ladies! I made this. (Doubled the recipe, I might add, to freeze for another night.). My husband asked where I got the take out from! ;). Needless to say it was super yummy! Very easy. I made it up early in the day and put it in the crockpot minus the zucchini and frozen tortellini. About an hour before serving I added it in. Very easy for our busy evening. This was just great. It will be a regular fall/winter recipe at my house from now on. I don’t love zucchini past tender-crisp, so I used 6 cups pf chopped baby spinach the last minute instead. Next time I may use kale. Thanks for a great recipe. Made this last night for dinner, and it was AMAZING!!!!! I couldn’t wait for lunch today so I could have it again. Love it! This soup was amazing! I am normally not a fan of Italian sausage but thought this was delicious. I used turkey sweet Italian sausage. Can’t wait for leftovers! Well, I made this right after you posted it. I have been on clear liquids for medical tests this past week, and was looking for something tasty, but nutritious to make. I decided to make the Tortellini Sausage soup. My grown son was leaving for a concert, but asked me to please save him some soup–he remembered it from the first time. Oh, I had to look for somewhere to tell you just how wonderful this soup is. Two thumbs up…..again. This might sound weird but… my husband doesn’t like cheese. At all. I’m constantly finding gooey cheesy recipes and try to figure out if I can somehow still make it without the cheese. Do you think this recipe would still taste good with some other type of noodle and not the tortellini with cheese? This soup has become a staple in our house. I’ve served it for company too, and everyone loved it. It’s easy but incredibly delicious. I use your cook books almost daily, my family eats very well as a result. Thanks for sharing all your recipes! Pingback: New Series: We’re a little ObSISsed! Thank you so much for sharing this delicious recipe! I have made it many, many times now and it is definitely a family favorite. Because it is packed with veggies it’s my go-to meal to bring when someone is sick or there is a new baby in the family. I pretty much make it according to the recipe every time (although I use shredded carrots and I puree the diced tomatoes) and it’s always amazing. I just did a bunch of measuring and multiplying so I figured I’d share with you all. I found this makes 12 c soup. For each cup, there are 170 cals 9 g fat 6.5 G protein 15 g carbs. I didn’t count veggies just because a person shouldn’t be penalized for eating veggies. If you were going to freeze this, would you prepare it through the addition of the tortellini and then add those when reheating? Or does the finished product freeze ok? I want to make some to eat and save half for when my baby arrives! Do you think you could use apple juice instead of cider or would that mess it up? I see 2 T of dried parsley listed twice in the ingredients list. I assume that’s a mistake… I’m excited to try this for dinner this week! Where did you buy your cute ramikin bowls??? have you ever made this in a crock-pot? if not, do you think it would work to do it in a crock-pot? This is one of our family’s favorite soups. Thanks! I have made this many times with apple juice. It works the same. I made this last week and my husband is begging me to make it again. It is seriously one of the best recipes for soup I’ve ever made. It will be a regular at our house. Thank you so much. Sometimes when I don’t have apple cider (which is most of the time) I sub in applesauce – I love the slightly thicker consistency and it adds that great apple flavor. 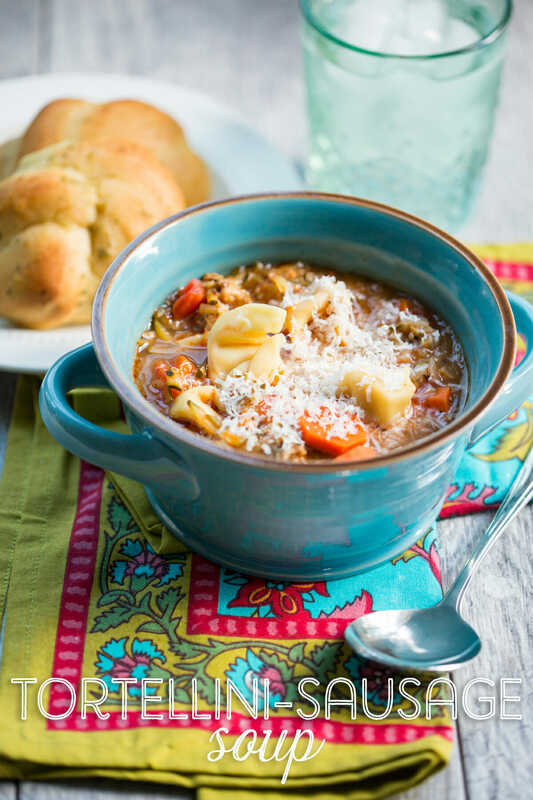 We love love love this soup! One of our favorites from your cookbooks!! SOOOO delicious!! and the apple cider just gives it a distinct amazing flavor! !